This last Saturday the 19th I ran a Basic Fantasy RPG session at QuinCon 29 in Quincy, IL. My pass said “Special Guest” and they really made me feel welcome. Three of my regular players, Jason Brentlinger, Josh Eaton, and Chris Wolfmeyer joined me, along with Rob Cook (a former player whose schedule sadly doesn’t work with ours these days) and three players I didn’t previously know: Craig Philips, Jared Thrapp, and Richard Rittenhouse. I chose Castle D’Angelo from my upcoming Strongholds of Sorcery multimodule. It’s an insane romp, and I knew there was no way they’d finish it, but it made an excellent introduction to the game for those not familiar with it. I should mention at this point the incredible debt I owe to Stuart Marshall and J.D. Neal, who contributed extensively to the adventure. The charge of the boars at the very beginning was quite funny, actually. After taking a few shots at them, the player characters let them pass outside and closed the outer door. Barthal, played by Richard Rittenhouse (I hope I have that right) peeked into the keyhole of the room into which an NPC fled, and made his saving throw against the poignard she shoved through it. Got to keep his eye… good move. I loved his characterization of Barthal as a halfling who loathed humans. Barthal again, escaping the ire of the madman with the dominoes and getting drops of alchemist’s glue in the hair of his feet. A well-planned illusion by Morningstar, played by Chris Wolfmeyer, allowed them to set the wild boars in the ground floor of Roland’s Tower against the wandering band of Nazgorean Frogmen that threatened them, and then Lucas, played by Jared Thrapp (I think, if I didn’t get the names mixed up) finished them off with a fireball. I think they were relieved to have something they could hit. Bork, played by Craig Phillips, was hilarious to start with (“basically he’s a moron,” Craig said about the character), but when he failed his save against the “crazy wave” (part of the adventure) I told him that Bork was convinced he was the smartest character in the group. He has an Int of 5, if I remember rightly. Craig played it to the hilt, jumping in to examine all the apparatus and all the magical books, even though his character couldn’t read. Apoqulis, played by Rob Cook, failed his save also, and his character became a pathological liar. Chris Wolfmeyer immediately reminded me that I had done that to Rob’s character in our regular game once before. I let it stand, and he was almost as funny as Craig… especially since nobody realized he had changed. So when he said he could no longer heal anyone, they took him seriously. Toward the end, on a hunch apparently, Jason figured out that Remove Curse would cure the insanity of a single victim, and he cured an NPC who could give them useful information about the castle. We were ready to wrap up then, so I gave those who were interested a brief rundown on how the adventure would play out. Everyone who attended signed the sheet for credit in the module, so all those guys will be listed as playtesters starting with the R12 release of Strongholds of Sorcery. 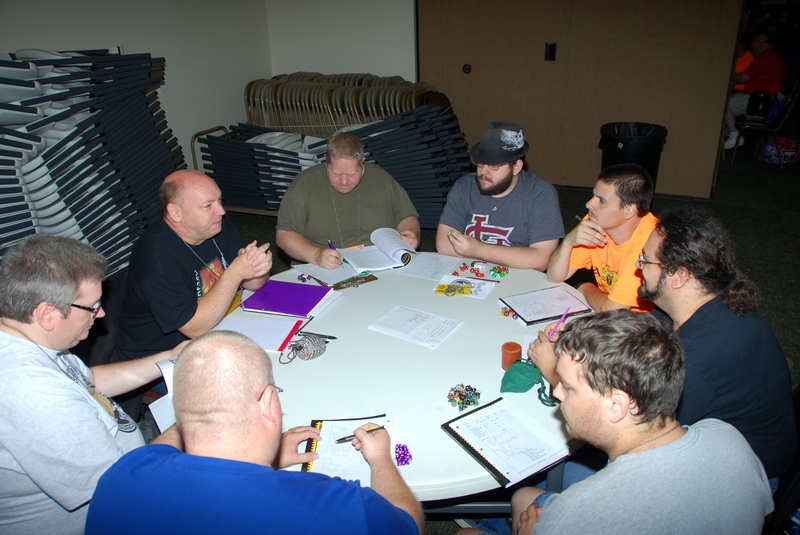 I gave out free copies of the Basic Fantasy RPG Core Rules, signed by me; my regular players declined, so I could give those copies to someone else, which I appreciate. I also donated two copies of the Core Rules and the original CreateSpace.com proofs of BF1 Morgansfort and BF2 Fortress, Tomb, and Tower to the QuinCon charity auction, all signed of course. It was great. I’m definitely planning to return next year, and I think I’ll go hard-core and run Slaver’s Fortress from AA1 Adventure Anthology 1 next time. Give ’em something to hit. This entry was posted in Promotion on July 21, 2014 by Solomoriah.